Ona Judge: "A thirst for compleat freedom"
On 24 May 1796, a runaway slave notice appeared in The Pennsylvania Gazette--according to the notice, a "light mulatto girl, much freckled," had "absconded" from her owners. 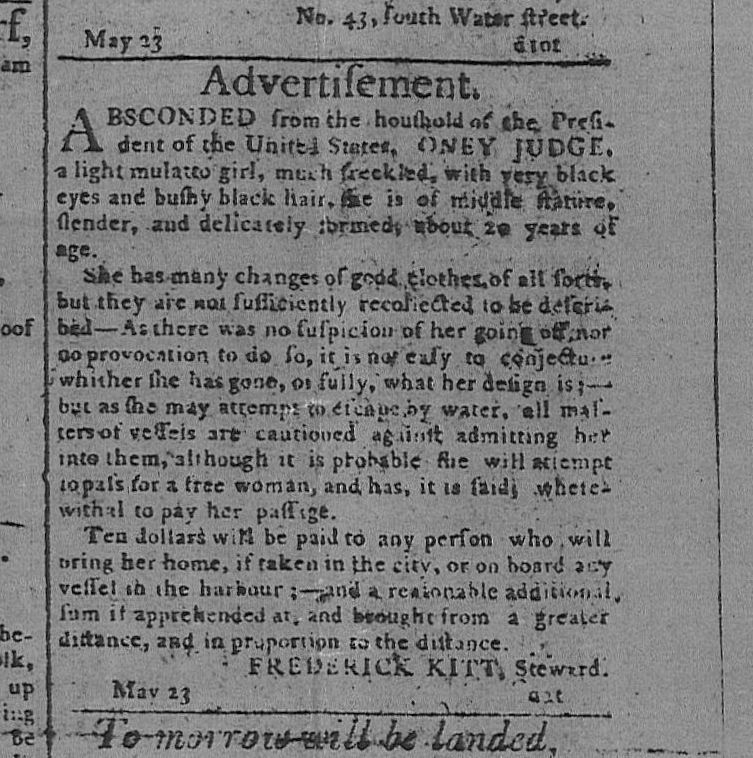 On the one hand, there is nothing very unusual about this "advertisement"--which described the escaped slave as having "very black eyes" and "bushy hair," as being "delicately formed" and "about 20 years of age," and of taking with her "many changes of good clothes, "of all sorts." It's easy enough to find thousands of similar runaway slave "advertisements" online. The North Carolina Runaway Slave Advertisement database, for example, provides access to more than 2300 such notices, "published in North Carolina newspapers from 1751 to 1840." Similarly, the Geography of Slavery database provides access to "more than 4000 advertisements for runaway slaves and indentured servants, drawn from newspapers in Virginia and Maryland, covering the years from 1736 through 1803." 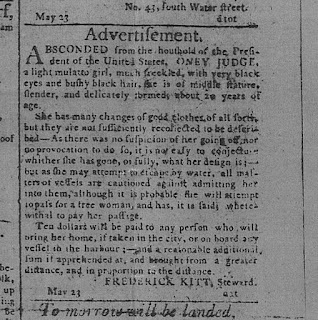 So, the advertisement for this "absconded" slave is just one of tens of thousands such published notices. According to the notice, she "had no provocation" for running away, and a reward is offered to anyone "who will bring her home." What makes the ad notable is not its content, then, but its source: As the advertisement specifies, the young woman has escaped from the household of "the President of the United States." Yes, the woman who escaped, Ona Judge, was one of the enslaved people in the household of George Washington, who was then serving as the President of the United States. Ona Judge was a personal slave of Martha Washington Ona had been one of the slaves who belonged to Martha's first husband, Daniel Parke Custis, and when Martha married George Washington, she brought these slaves, including Ona, with her to Mount Vernon. In 1789, George Washington took a number of his slaves with him to New York; when the new federal capital was moved to Philadelphia, he took his slaves, including Ona, with him. But according to the Pennsylvania Gradual Abolition Act of 1780, all slaves residing in the state for more than six months could free themselves. Slaveholders had found away around this act, however, by rotating their slaves in and out of the state. A 1788 amendment to the Gradual Abolition Act closed this loophole--but Washington (and other members of the government) found a way around the act and its amendment, claiming that the legislation applied, in strict interpretation, only to members of the legislative branch of the new federal government. Members of the judicial branch and the executive branch--including Washington, as president--were exempt. And so, as Mary V. Thompson writes, "George Washington showed that he, a man whose reputation was built on honesty, would lie to protect property rights." But this solution, however clever, did not fool Ona. Once again about to be shipped off to Virginia, where she was to be given as a wedding present to Martha Washington's granddaughter, Ona Judge fled on 21 May 1796. The Washingtons made a great deal of effort to recover their "property," but they were not successful. Ona Judge, born about the year 1773, escaped to New Hampshire, where she married, had children, and learned to read and write. She died on 25 February 1848. Ona Judge Staines was interviewed in the mid-1840s, her published interviews detailing her life, her experiences as a slave owned by the Washingtons, her escape, and her subsequent life as a fugitive slave--she was never freed by the Washingtons and thus she--and her children--always lived with the possibility of being returned to the Washingtons' heirs under the provisions of the Fugitive Slave Act. When asked whether she regretted her escape and the difficulties of her later life, she replied, "No. I am free." For an excellent article by Mary V. Thompson, "William Lee and Oney Judge: A Look at George Washington and Slavery," Journal of the American Revolution, click here. You may also want to look at Erica Armstrong Dunbar's new analysis of the life of Ona Judge Staines, Never Caught: The Washingtons' Relentless Pursuit of Their Runaway Slave, Ona Judge." For a link to an interview about her book, click here.